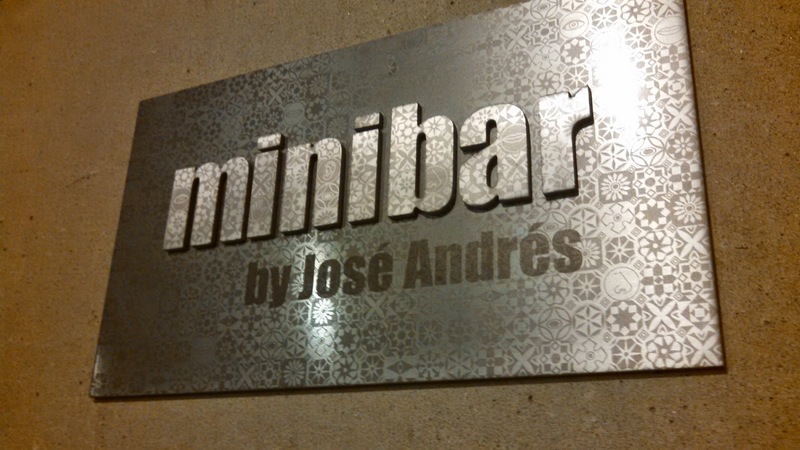 minibar by José Andrés, a two Michelin-starred restaurant, is a study in avant-garde cooking where each bite is designed to thrill the senses by pushing the limits of what we have come to expect - and what is possible - from food. 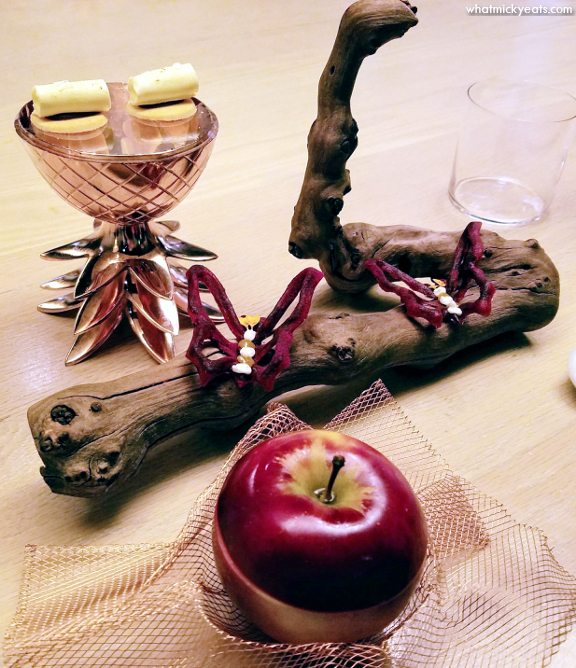 The creations combine art and science, as well as tradition and technique, to deliver an imaginative and progressive tasting menu, offered at a communal setting for up to 6 guests. The menu price is $275 per person (excluding beverage, tax and gratuity). Beverage pairing options are available. Closest Metro is Gallery Place. 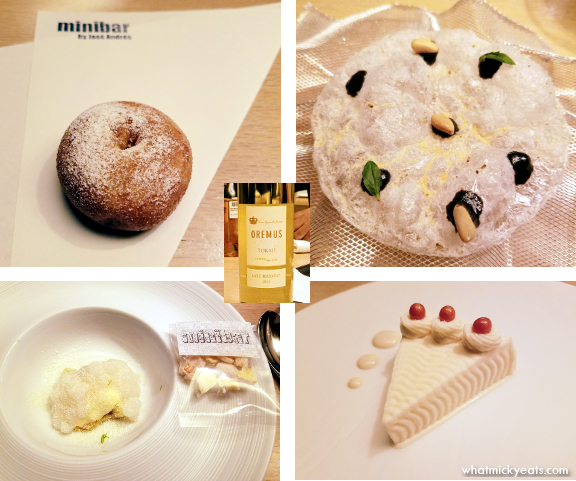 Keith surprised me for our early Christmas dinner by treating me to this fun and fantastic dinner at minibar. When we arrived we were escorted to a small front room for sparkling wine and a little nibble that looked like a long cracker but tasted just like Pizza Margherita. Already, I knew we would be in for an incredibly creative evening. Soon after we we escorted into the kitchen with a communal table. Here we were presented with Pineapple Shortbread, Beet Butterfly, and a Black Rock Orchards Apple Hot Toddy. The presentation was so cute and the nibbles paired well with the last of our cava. 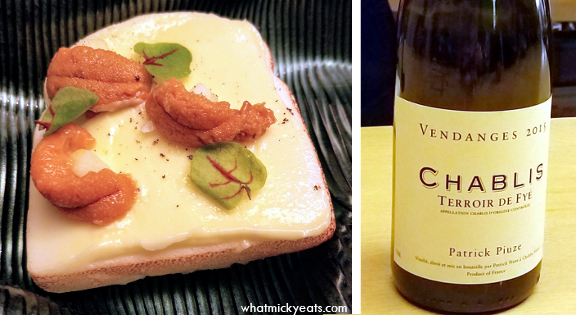 Next were more appetizers paired with 2015 Patrick Pluze Terroir Decouverte from Chablis, France starting with a delicate and briny Hokkaido Uni Toast. 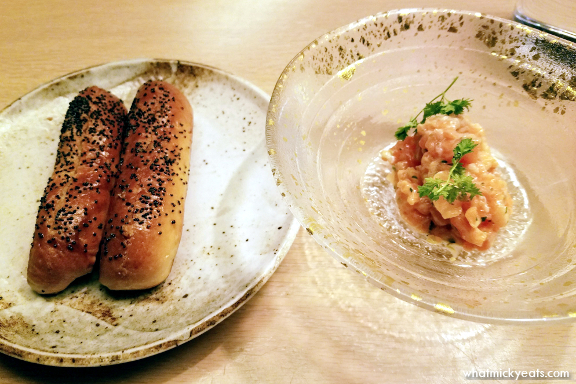 We were told this dish was inspired by chef's travels to Japan. 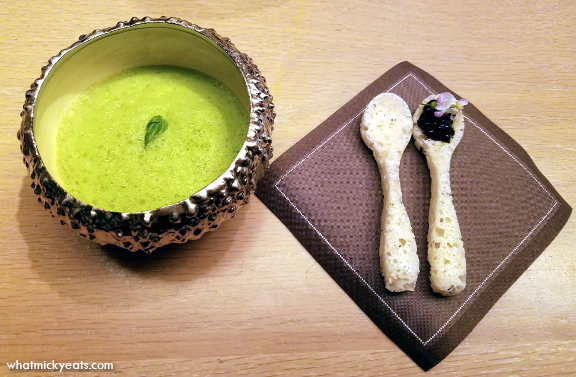 The Parmesan Spoons were completely edible and dipped into a basil foam. One spoon had little drops of balsamic that added a burst of vinegar flavor to the sharp cheese. 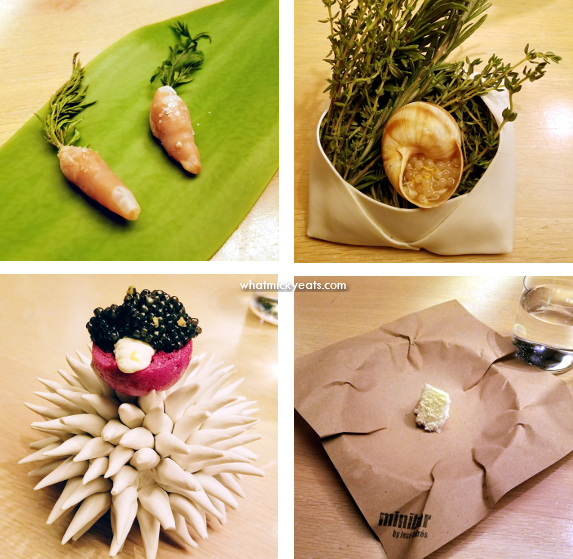 The next set of appetizers included Coco-Carrot - a frozen bite filled with coconut gel; Snail Caviar - with jamon juice; Beet Blini and Osetra Caviar; and a Gorgonzola Dolce - basically dry ice-frozen cheese. To clean our hands, we were given a washcloth that was poured over with warm tea. This is another Japanese tradition, since so many dishes are eaten with ones fingers. 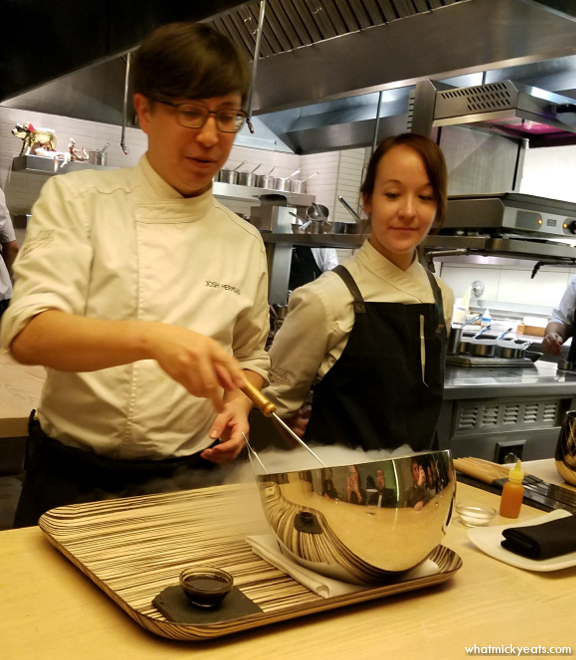 The head chef then presented us with a more interactive serving of Pumpkin Tart - where he froze pumpkin gel on a metal mold and then they filled with warm oil and served to each person on an individual spatula. This was our transition into the next set of warm dishes. 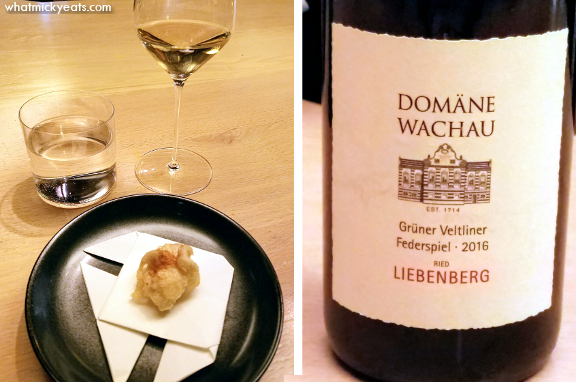 Paired with a 2016 Domane Wachau Gruner Veltliner Federspiel, Ried Liebenberg fromWachau, Austria we ate a Cod Milt Tempura. The texture was creamy and the flavor a bit bland. 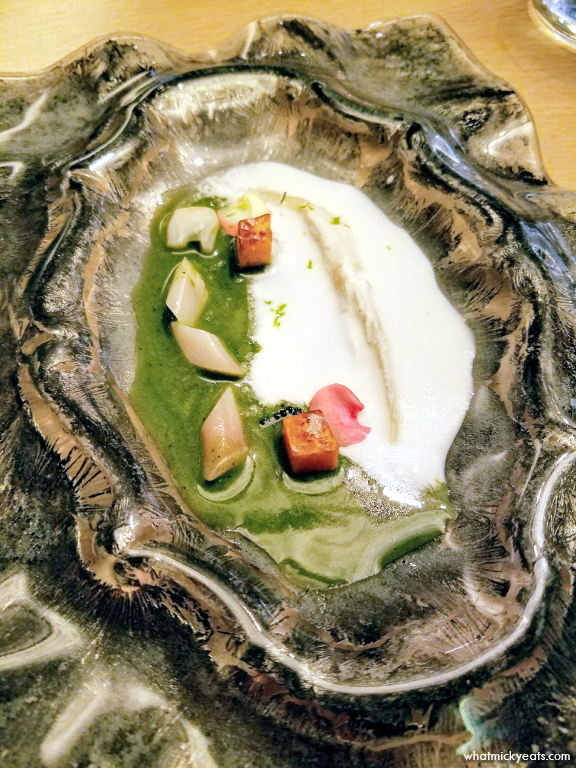 I thought it might be an organ of some sort, but after we ate it, we were then told it was the sperm of the cod, and is considered a delicacy in Japan. Eek. I adored the wine though, as this varietal is one of my ultimate favorites. I loved watching the chefs plate each dish so intricately. Here, I shot them making Atlantic Razor Clams and Plankton. The flavor profile was very Peruvian with lime and coconut. Last of the white wines, we had a 2014 Ramey Chardonnay from Sonoma Coast, California. 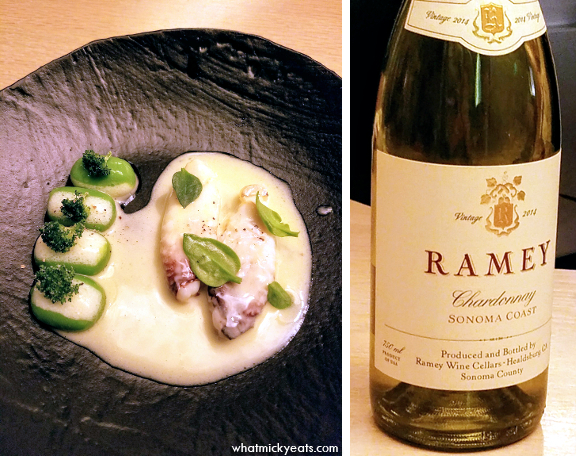 This chardonnay was incredibly buttery and oakey - not my preferred notes at all - however, it paired expertly with the next dish of Lumi Island Crab with Broccoli & Cheddar. The crab was so tender and covered with a decadent butter sauce. The large gnocchi-shaped green balls were bursts of gel that tasted exactly like broccoli and cheese. It was mind blowing, and my favorite dish of the night. Next, we tried a 2014 Domaine les Bruyeres Les Crois from Crozes-Hermitage, France. It was a very dry red that was paired with Thai Rabbit and Figs. The rabbit was tender, and bit hard for me to get out of my head (poor, Thumper! ), but had light foam of coconut and the sweetness of the figs were lovely, too. 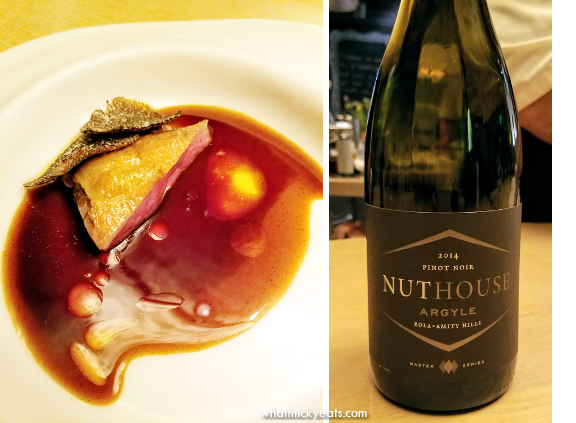 The next dish was Squab Salmis and was paired with a 2014 Argyle Nuthouse Pinot Noir from Willamette Valley, Oregon. The squab was too much like red meat for me, so I quickly passed my piece over to Keith. I enjoyed the wine, though. The next dish I had was Salmon Tartare that was a substitute for the Cabbage and Steer that Keith ate (not pictured). Paired with a 2009 Rovellotti Riserve from Ghemme, Italy, I loved my little salmon rolls. 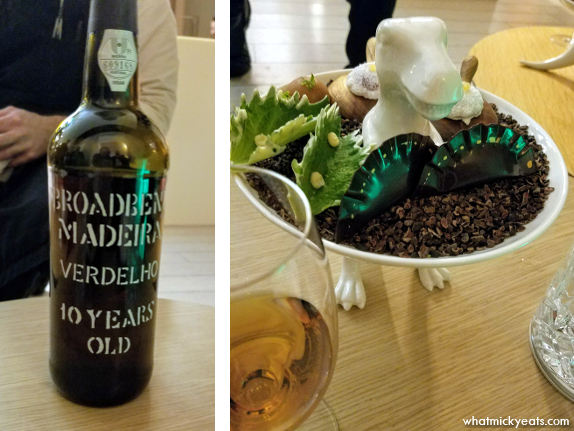 With this same wine, I had Tortilla Espanola - a creamy, cheesy, oniony cream while Keith ate Oxtail al Jerez - a more brothy variation (not pictured). Then we had a Shaved Ice Salad, that was oddly cold and too watery for my liking. 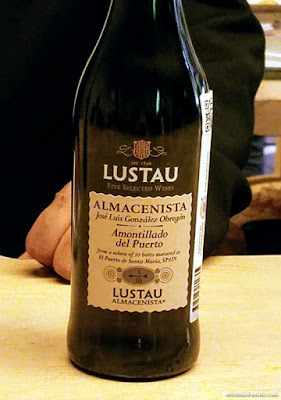 Transitioning to desserts, we had Almond Cake paired with NV Lustau Almacenista Amontillado Sherry from Jerez, Spain. It was not very sweet, yet quite nutty and a bit dry. We also had Macamba Tapioca - with pineapple and coconut flavors; Coca Colce with Asian Flavors - a rice cake with pine nuts; and a Fried Doughnut - which was really ice cream. 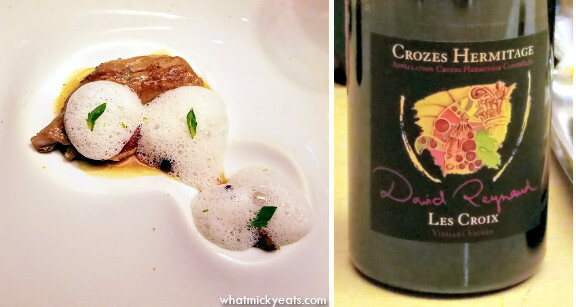 The last three dishes were paired with a 2015 Oremus Late Harvest sweet dessert wine from Tokaji, Hungary. We were then escorted into the bar area to sit in the lounge chairs and finish our desserts. A cute porcelain dinosaur arrived carrying Raspberry Mochi, Key Lime Pie Bon Bon, Coriander Abanico, and White Chocolate Shiso Leaf. These finishing bites were paired with a NV Broadbent 10 year Verdlho from Madeira, Portugal. 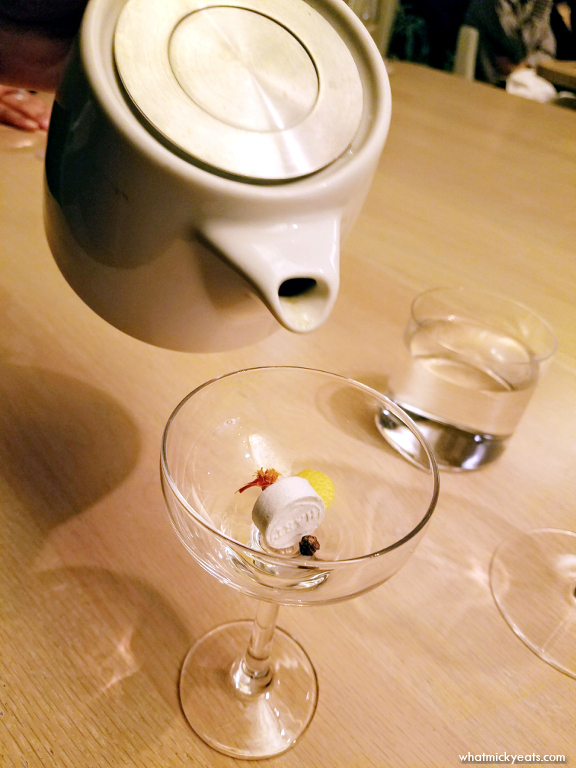 We were invited to stay and linger with coffee or tea, but we were quite full and buzzed from all the wine pairings. 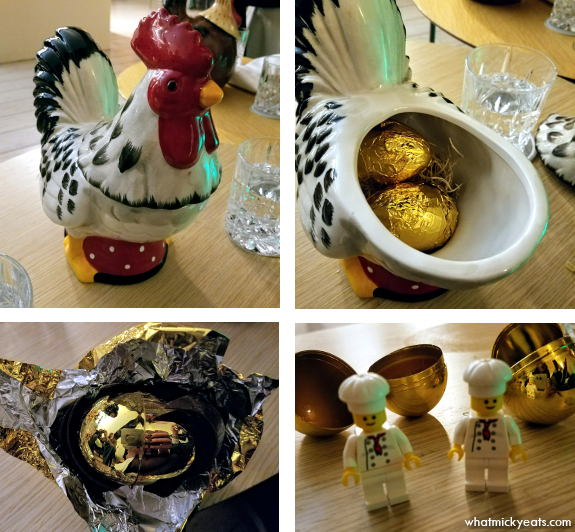 Our bill arrived discreetly in a ceramic rooster that had a chocolate covered Golden Egg. Inside the egg was a fun Lego chef toy that I might have saved as a souvenir. All in all we had a fantastical dinner at minibar. The food and service were excellent with just a few slight hiccups*. Yet, the decor and ambience of the jovial and inviting bar really added to the creative evening. I always enjoy trying new places with Keith, and having these Michelin restaurants in our home city is a luxury, for sure. *Keith asked me to explain the hiccups... I am left-handed. 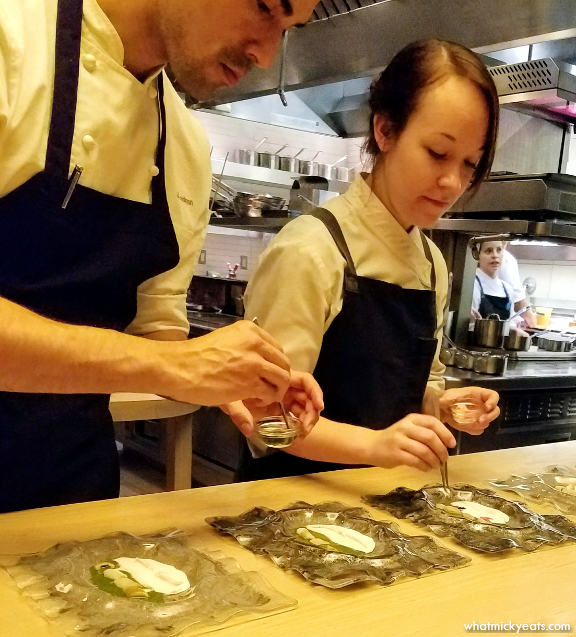 I had read on other reviews that minibar servers pick up on this when observing the guests, and would accommodate your flatware and glass settings appropriately (as other fine restaurants do). Well, this did not happen for me despite my own subtle movement of the fork and knife when freshly placed in front of me... multiple times. Further, the gentleman to Keith's right was also a lefty, and we noticed they did place his serveware correctly. So why him and not me? I didn't mind that much, and it became a little game for me to see if they would notice me moving my fork or glass each time. *snark* Hiccup two was a fumble with one of my dish substitutions. I have an aversion to red meat, so when they presented goat as an alternative to beef, I balked. They quickly made a new alternative, but it made things awkward. Hiccup three involved confusion with the bill. We weren't charged for our drink pairings, and while others may have happily left without paying, we were honest and paid up. 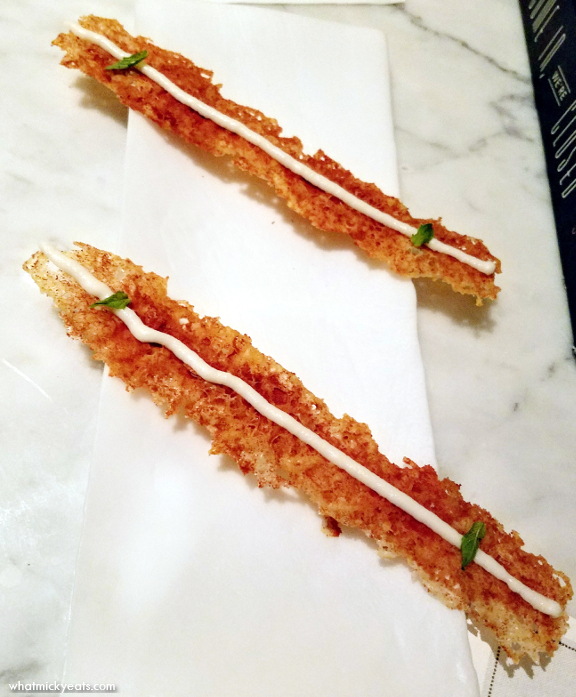 These hiccups are not really a big deal, but if you're going to pride yourself on those details, I expected them to follow through especially for Michelin star standards.